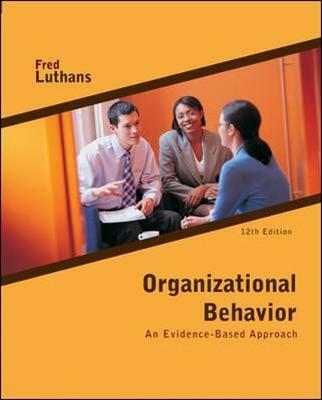 Organisational Behavior by Fred Luthans was one of the first mainstream organisational behavior texts on the market and continues the tradition of being the most current and up-to-date researched text today. Well-known author Fred Luthans is the 5th most prolific Publisher in Academy of Management Journals and a senior research scientist with the Gallup Organization, who continues to do research in the organisational behavior area. The Twelfth Edition of Organisational Behavior is ideal for instructors who take a research-based and conceptual approach to their OB course. Fred Luthans is the George Holmes Distinguished Professor of Management at the University of Nebraska-Lincoln. He received his B.A., M.B.A., and Ph.D. from the University of Iowa where he received the distinguished alumni award in 2002, and did postdoctoral work at Columbia University. While serving as a Captain in the U.S. Army, he taught at the U.S. Military Academy at West Point. He has been at the University of Nebraska since 1967, his entire academic career, and won the distinguished teaching award in 1986, the excellence in graduate education award in 2000, and in 2008 the highest award in the system for outstanding research. In 2003, he received an honorary doctorate from DePaul University. A prolific writer, he has published a number of major books and about 200 articles in applied and academic journals. His book Organizational Behavior Modification, coauthored with Robert Kreitner, won the American Society of Personnel Administration award for outstanding contribution to human resource management, and another book entitled Real Managers is the result of a four-year research study that observed managers in their natural settings. International Management, coauthored with the late Richard Hodgetts and Jonathon Doh, also published by McGraw-Hill, is in its seventh edition. He also has two recent books, The High Impact Leader (with Bruce Avolio, McGraw-Hill, 2006) and Psychological Capital (with Carolyn Youssef and Bruce Avolio, Oxford, 2007). The co-editor-in-chief of the Journal of World Business, Professor Luthans is also the editor for Organizational Dynamics and Journal of Leadership and Organizational Studies. He has been very active in the Academy of Management over the years and was elected a fellow in 1981. He is a former president of the National Academy in 1986 and, in 1997, received the Academy's distinguished educator award. In 2000 he became an inaugural member of the Academy's Hall of Fame for being one of the "Top Five" all-time published authors in the prestigious Academy journals. Also active in the Decision Sciences Institute (DSI), he was elected a fellow in 1987. Professor Luthans has a very extensive research program at the University of Nebraska. Most recently, he has developed positive organizational behavior, or POB, (outlined in 2002 articles in the Academy of Management Executive and Journal of Organizational Behavior ) and is conducting research on positive psychological capital and, with close colleague Bruce Avolio, authentic leadership. He has been a visiting scholar at a number of universities in the United States and has lectured at universities and conducted workshops for managers in many countries around the world. In recent years, he has been actively involved in Germany, China, Thailand, Singapore, Russia, Albania, and Macedonia. In addition, he has been on the executive committee of the annual Pan Pacific Conference since its beginning in 1984 and in 1995 was elected a fellow. This international research and experience is reflected in his approach to the field of organizational behavior. In addition, he is an active consultant and trainer to both private- (such as Wal-Mart and Ameritas Life Insurance, Inc.) and public-sector organizations. Since 1998 he has been a senior research scientist with the Gallup Organization. He is an avid golfer and University of Nebraska sports fan. He and Kay, his wife of 47 years, have four grown children and so far six adorable grandchildren.